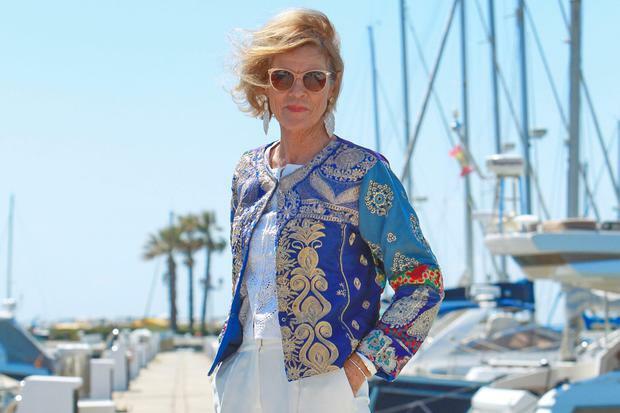 Stylish Sandra has four children: Amber, Vogue and Frederick, from her first marriage, and Alexander, from her second marriage to highly successful businessman Neil Wilson, with whom she now lives, between Howth and Spain. The suggestion came after Vogue, whose Instagram account has more than 500,000 followers, posted a picture of her mother, now 65, who was not on social media at the time. "I didn't really understand it too much," Sandra says now. But she noticed she was getting more compliments about her style - not surprising, she says, pointing out that she is almost always wearing a hat and she stands out. That's being modest though. Sandra has a way of making dramatic silhouettes and bold colours look enviably easy to wear. Her Instagram account, @sandrawilson3614, was launched in September of last year. Sandra now has more than 11,000 followers, and of late, there have been a few jobs with her famous daughter. If she lived solely in Ireland or England, as opposed to between Howth and Spain, it is quite likely she would be by now inundated with offers of #Ad or #sponcon. "I thought, 'Oh maybe I'll give it a go'," Sandra tells me now. "I've plenty of clothes anyway." You get the impression of someone who doesn't take life too seriously, who enjoys herself, doesn't sweat the small stuff. So far, the reaction from her followers has been almost universally positive. Someone commented on her fingers being very fat, a comment she dismisses as nonsense. Below one outfit, a follower remarked that this was not their favourite outfit of hers. Very sweetly, Vogue jumped in with her own comment; "One of my favourite of her outfits." "I mean you can't be sensitive," Sandra says. "You're putting yourself out there, so I'm hardly going to be sensitive. I say to Vogue 'Don't be sensitive, that's how you make your living, you have to put up with it'." Sandra clearly has a take-it-or- leave-it approach to social media. "People are entitled to their opinion but sometimes they're kind of silly. If I thought I was getting very negative publicity, I'd say to myself, 'Oh no, I'm not going to do this any more'. But I actually enjoy doing it. When I get myself all ready and get my picture taken, I think to myself, 'I was never photogenic before'. They used to laugh at me, Amber and Vogue, when they'd be taking my picture. But now I seem to have got myself into a way where pictures are coming out better than I expect. I don't know what I did before, but I was terrible. They'd spend their lives laughing at me if I took a picture." Her daughters still borrow from her wardrobe when they visit her. "They'd come down here and on the night before they were leaving, they'd all wear my clothes so they wouldn't have to wash. They'd have cases of clean clothes going home." 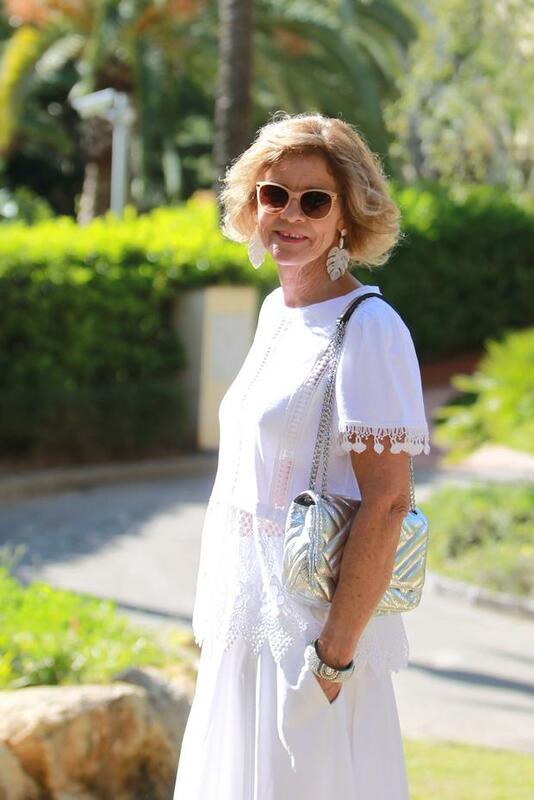 Her feed is almost all outfit-of-the-day posts, with occasional shots of her grandson, the adorable Theodore (she has three grandchildren, as well as Vogue and Spencer's son, another grandson and granddaughter). Her husband Neil takes most of her pictures. "If he doesn't behave, he'll be fired," she laughs. "No he's good. It's like Spencer. Spencer didn't like doing them, but now he doesn't mind doing them for Vogue." Typically, Sandra posts daily. "That's a little bit of work," she says. "Most days though I would put my make-up on. I like to be finished." Her style, which she describes as eclectic, is a mixture of colour, clever layering and classics mixed with something fanciful. It's fun, and joyful, and speaks of a woman of confidence, who knows what she likes. Zara is a favourite, she says, describing herself as a person who does not tend to spend money on very expensive pieces. "I was trying to organise my wardrobe yesterday but it didn't really come to great fruition. Because I don't really like throwing things out. I would make an effort to make everything colour coordinated. I would think in advance about my outfit, because I quite like doing it. It's like painting a picture to a certain degree." She enjoys pushing the boat out a little, she admits. "Try something different. Don't always be stuck in something. 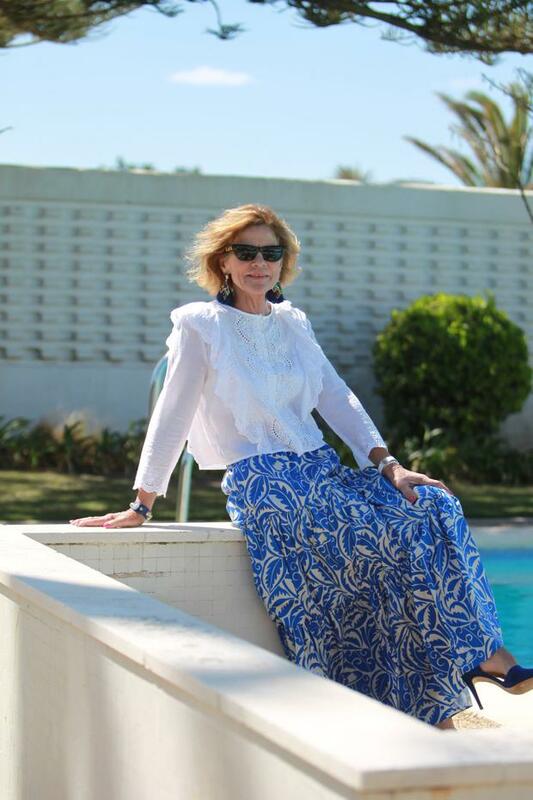 I just think it's better than morphing into old age," she says of her attitude to personal style. "I think try and add a little bit of colour to yourself." Recently, the elegant Sutton native modelled in the Joanne Hynes for Dunnes Stores fashion show. "That was great fun, I was delighted with myself. It was an experience. You should try and experience everything you can. I thought I'd be more nervous than I was." She likes to look after herself, she says. "Exercise is not something I like doing. Like, Vogue likes the gym, she thinks it's great. It's a discipline, and it makes you feel stronger." The golf club near their home in Spain has a gym which she regularly attends, as well as Pilates classes, and golf several times a week. "I wouldn't have any problem putting a bikini on, who says you can't wear a bikini?" But it is her former career as an air hostess for Aer Lingus which really left a lasting impression on her standards of personal appearance. "I used to fly, and you had to pass a grooming test before you went on a plane. And if you'd put on weight, they would tell you. You had to wear lipstick and stuff. The woman in charge of the section would be sitting there, and you just had to go in before you got on your flight." Instagram is doing something important for women outside the ages typically targeted by mainstream fashion media, which to a large extent often ignores women of a certain vintage; providing a platform and a presence they otherwise wouldn't be allowed. Former magazine editor Alyson Walsh first opened her account @thatsnotmyage because she "wasn't seeing anyone that looked like me in the media, and I wanted to celebrate the fact that older people are cool too and you don't just disappear off the radar once you're over 40", she once told The Guardian. Two Irish accounts with growing followings, @overthehilda and @mary_dunne1, are doing something similar. How does Sandra feel about ageing? "Well, I would love to have something done to my face. Get rid of a few lines," she laughs. "When I was young, nobody used sun tan lotion. But I would say my husband would have a fit. He would say, 'No, don't do anything'. So on that basis I won't. You look at yourself in the morning in the mirror and you might be delighted with yourself. You could look at yourself four hours later in the mirror and say 'God, what happened to me?' Nothing's changed in the picture, it's just you yourself, in your mind have changed. "Most of the time I'm happy. I am the age I am." She's not a big believer in the adage that certain things should not be worn because of your age. Short skirts are out, but that is more due to preference rather than a perceived age restriction. "I wouldn't wear a mini skirt, because I don't think I've great legs. I wouldn't think my legs would be my best asset. So I think you dress towards what suits you." Sandra has always loved style. As an air hostess, she would travel to New York, and once there she relished exploring the shops. She was a working mother though which, she says, was quite tough. "It was hard to make sure you had somebody right to mind the kids. Especially if you were going away for two or three days travelling with work, you had to have somebody good. "I think I missed a lot when I was a mother. Because I notice a lot now with my grandchildren compared to what I did with my own children. I think when you're immersed in it, you haven't the time to see it. Now I have more time to look at anything. You're not doing the grunge work. But I see Vogue is really enjoying it. Theodore is such a happy baby, he literally never stops smiling. They get the best of pleasure out of him." It's an ability to enjoy life she clearly benefits from herself. Jemma Crew The world's biggest Primark store is to open in Birmingham, bringing water fountains, charging points and recycling areas to shoppers.